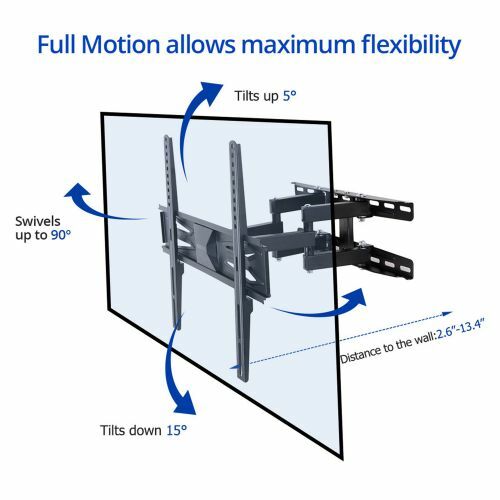 Full motion allows maximum flexibility: Extend your TV between 2.6″ and 13.4″ from the wall. Constructed with 6 articulating arms: Well-designed six-arm structure ensures stability nearly 4 times higher than that of other brackets. 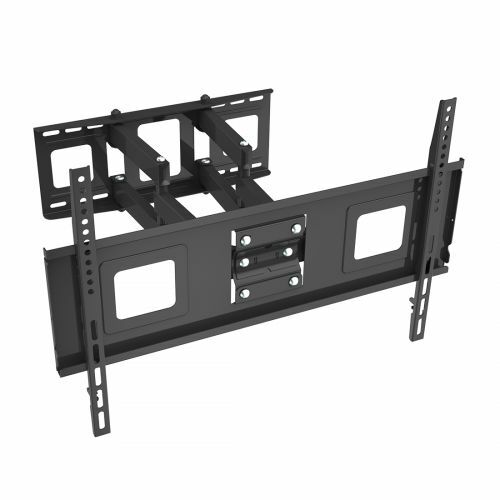 Universal hole pattern: Diverse hole pattern and side to side adjustment allowsthis TV wall mount to fit nearly all flat panel TVs. 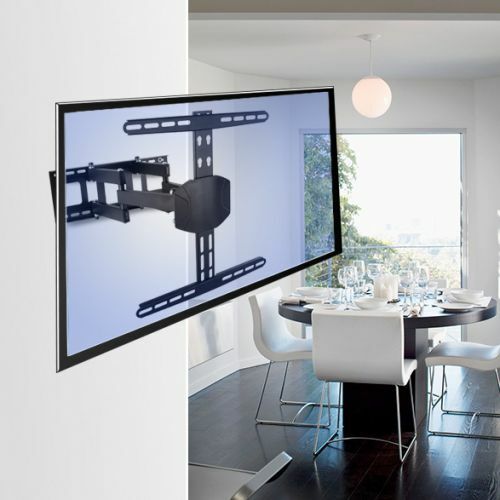 Tilt your TV for perfect viewing: Adjust the angle in every direction for easy viewing from any seat in the room. Extended articulating system: Wide-angle swivel between -45°to +45 meets different viewing needs. The TV set can be manipulated in several positions to accommodate normal TV shows, video gaming, fitness programs, video chats and more. 3°horizontal adjustment：You can fix minorinstallation errors within ±3°. 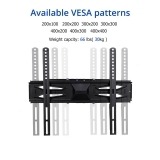 Cable management system: Cables that would otherwise go astray can be concealed effectively making the whole TV set clean and tidy. Great mount at a nice pric. Work well, heavy duty, used on a 65in tv. outstanding product. easy to install. very durable. I’m currently using it in my RV with a 32″ TV. It has done well and shows no signs of wear after all our trips. 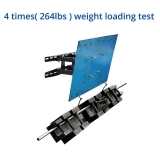 This product is extremely well made, sturdy and installed flawlessly in less than one hour. We hung a 65” Vizio Ultra High Definition and it looks great. Literally the best mount I have ever used for a TV. Extremely easy to use and the range of motion is exactly what I wanted. Keep it up! Used this in my bedroom to get my TV on the wall!! It was super easy to install and it looks awesome!!! My whole room looks better!! Works great with my tv! The mount was very sturdy and has nice movement and angles. I have a 44 inch Samsung (400 x 400). Fleximount met my exact requirements! Came with template, level, and even tells you what size drill bit to use. 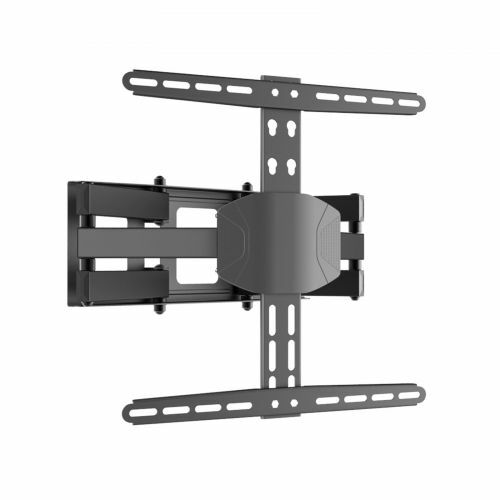 The name brand fits the tv mount itself, very flexible options for the angle, tilt, bolt placements, etc. sturdy, great quality for the price… Get it.. I bought this product a few weeks ago for my 55” TV and I read the instructions before mounting. I did all the necessary measurements and made sure I got everything right. 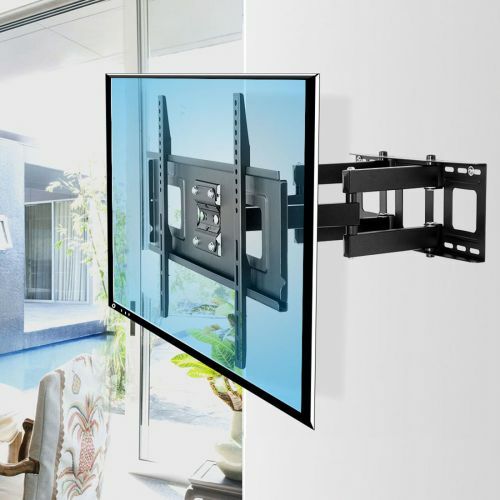 After drilling the holes and screwing in the brackets I was ready to hang my TV – well one of them..
Just what was needed, easy to install, and I have changed by tv size twice and works for each one…. Perfect little mount for what I needed. I have a newish Samsung that weighs about 35 lbs and this mount was perfect. Nice and heavy but not bulky! I would be hesitant about putting a heavier TV on here but thats just me. This TV mount is the perfect fit for my Visio E sereies! 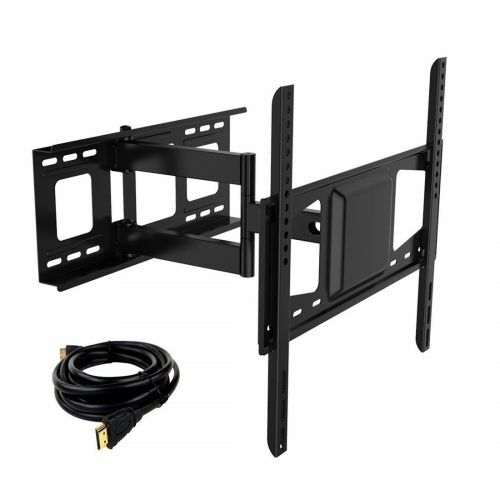 Very sturdy mount, strong enough to hold the TV without sagging out straining!…….. installation was a snap! Had my TV up in 30minutes! Five Stars!!! Had to do some minor modifications, my TV is from about 2006, and the mounting points must be different from newer TVs as mine were farther apart than the brackets would allow. Used a bit of aluminum flat strap, bolts, and nylon threaded nuts, and it holds it perfectly. Can’t blame anyone but myself for assuming all TV mounts were the same and not checking the measurements, but worked out well in the end. 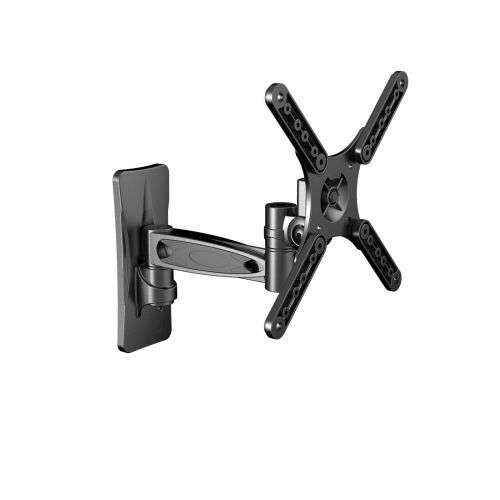 I purchased this wall mount for a 60” Samsung LED TV. It works perfect. 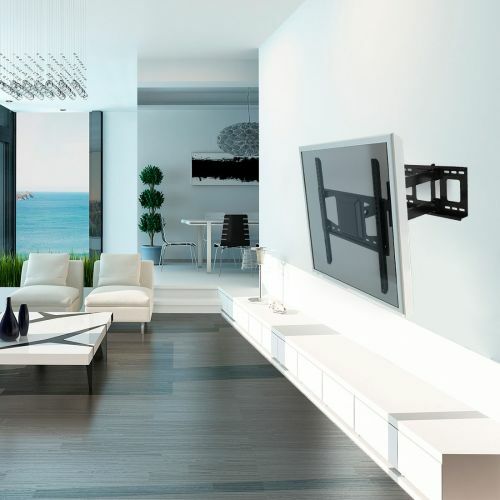 There are four choices for hardware to secure the brackets to the TV. 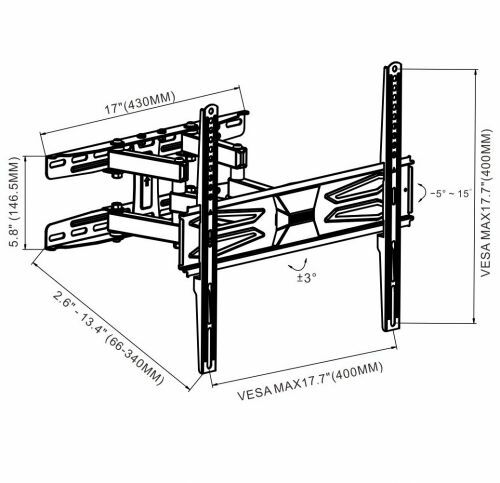 One of the choices fit my TV so I did not have to run to the hardware store for additional machine screws. Strong and strong. 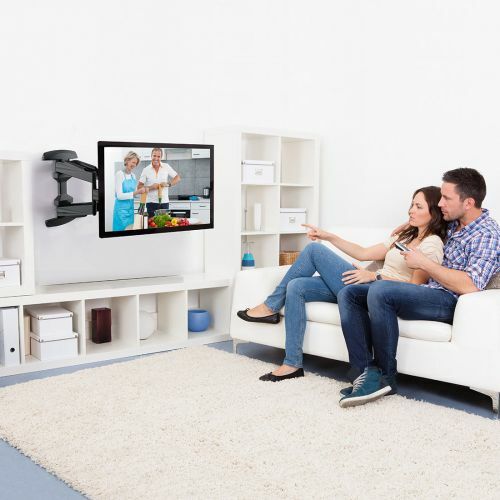 Our 55″ TV is able to mount in any position and that’s cool. I was worried because our tv is on the heavier side. But the product did not waver and can be minutely positioned easily. 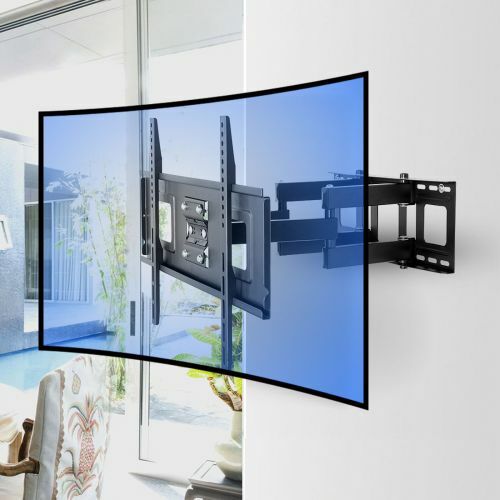 Easy to install and very flexible. Easy to stall and inexpensive . 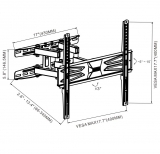 Have an old 55″ plasma TV, very heavy, that I wanted to be able to move around on the wall. This works perfectly. A bit hard to install (tool 2 people) and had to buy a socket set to tighten all the bolts. 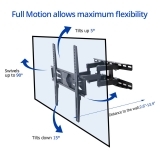 TV sits out a bit but has great range of motion plus tilts. Perfect. I mounted a Samsung 60″ TV and it works as advertised. Easy to install! Works great! Very good and the price beat other stores like Best Buy, etc. I use this for a 40 inch Roku TV in my bedroom. It has full motion and holds up quite nicely even with added pressure. And it’s about 1/3 of the price of what you’d find at your local Best Buy. I wait several months to review products so I can see how they stand the test of time, and I’m happy to report my TV is still in one piece! I’m also not very handy at all, but I was about to get this mounted by myself in about 30 minutes. We’ve used these for all our TVs and they’ve worked great. Easy to use and install. 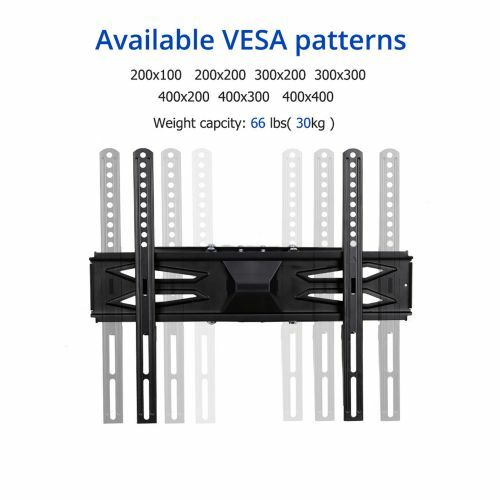 U can make it work for vesa 100×100 u have to remove the 4 center plate bolts washers and put it on the front side so u have clearance so bolts dont hit arms that attach to the tv! Perfect mount! Petite size, light weight. Been hanging for 3 weeks and we’ve had no issues. Will be purchasing another soon. the instructions and packaging the parts were well done, so you knew exactly which part went to another part which I appreciated. 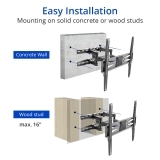 the product itself is very solid and gives the flexibility of pivoting it and pulling it a few inches from the wall. That helps easily put in and put out the HDM I cables. Works great, feels solid, easy assembly. Altogether very happy with this purchase. Works great and slim design is great. Works great so far!! We have a 32 inch TV in our bedroom we used this for. Super simple install, works as intended. It’s super sturdy and my 55in TV feels super solid mounted on it! Great product and price. 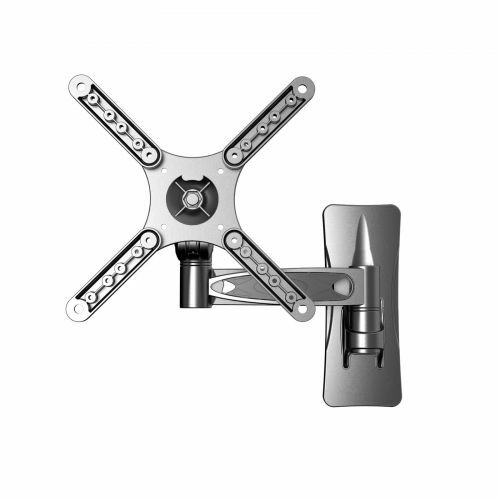 I was amazed at the outstanding I installed and the only difference between this product and the highest priced mount is that it has a screw to tighten to the bottom of the wall plate rather than a spin clamp. 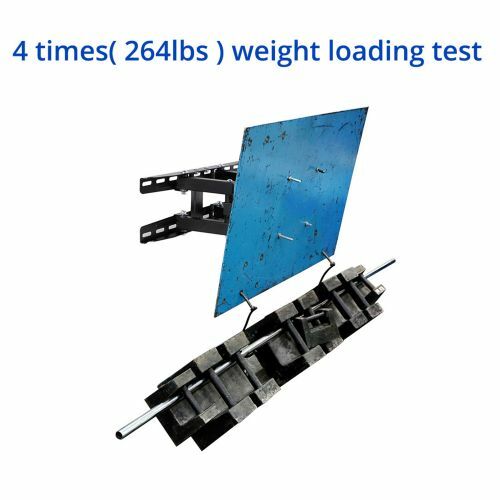 Anyone whom uses more than the required tools listed on the instructions or doesn’t even need/use instructions will be amazed with this product. I’m tempted to buy a few more to keep in storage for the next time I move to a new house. 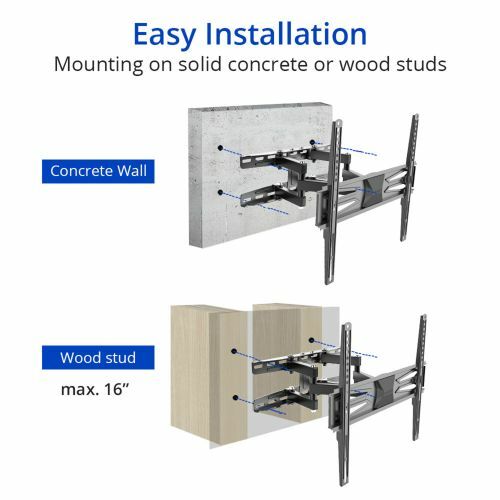 It’s very sturdy and easy to install. 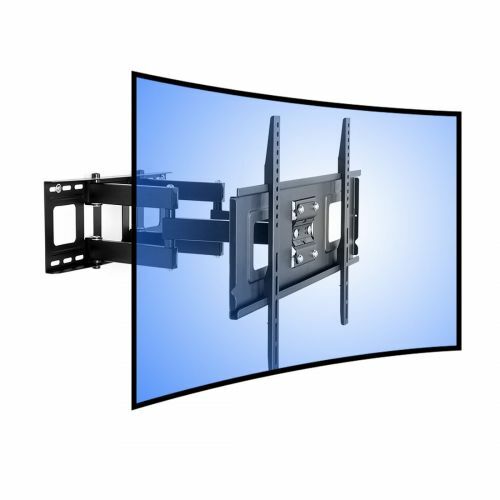 When you want to change the angle of the TV horizontally, it is a bit difficult. But I’d would still definitely recommend this product. DIY… mount instructions were there and written well enough that this 59 yr ,FEMALE DIY’ER could mount her 55”. Took me 45 minutes and most of the time was finding which of my walls had studs in just the right place (Then a call for help from my daughter to lift it onto the mount.). Once found the most muscle was screwing into the beams made easy by a drill and correct sized ratchet for finishing up. 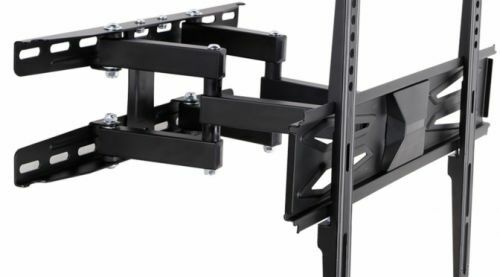 So I took pictures of the unit at right and left positions (mind you the moving of the bracket was not that easy, so someone bumping into it does not move the TV position at all. The rest of the pictures are the up tilt, down tilt and flat against the wall. For the quality and sturdiness of this bracket, you’d think the pricing would be steeper. It come with wall mount outline, plenty of screws ( there will be some left over). Remember you just can’t walk up to it and pull it out from the wall, you have to work it out with balance of each side and work it back flat the same way. Again this is a good design just in case it’s put up in an area that it can be bumped by mistake. It also leave the TV back accessible for plug and play etc. I’m buying another. Great value! There is nothing to dislike about this mount. Good quality and easy to adjust. That is enough. It’s not exciting, it’s not going to change the way you live, it’s not going to actualize you as a person. 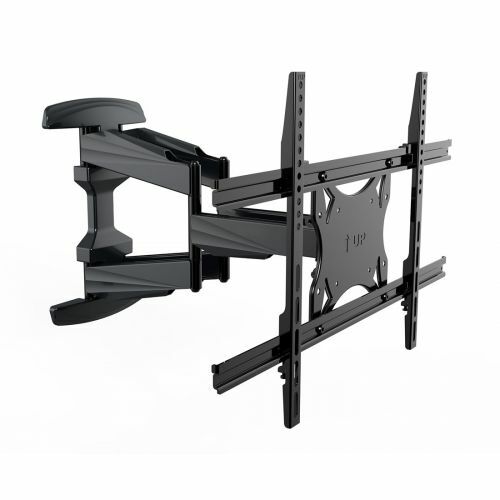 It’s a TV wall mount and it does this task as well as you could expect. Worked great on my 50 inch VISIO, has all the needed hardware. Easy installation for me. Easy to install. Had to loosen the nuts on the hinges so it was easier to move the tv around. My husband followed the instructions from the kit and mounted our 32” TV in our bedroom in 30-45 minutes. The kit came with everything we needed. Would buy again if we move and need to mount again. Like all the pivot points!! Easy/fast to install if you have an impact drill and gun. No complaints works as described. First off, when I opened the package, I found everything I needed to install the mount; a wall template, a bubble level, all the appropriate screws and bolts and complete instructions for a variety of mounting options. Following the instructions, the mounting process was easy and was able to get the TV mounted perfectly the first time! For the price, this product exceeded my expectations -I would definitely buy again (if/when the need occurs).